Looks like Egypt’s march to a better future is not as smooth as some in the west would have liked to think, the strengthening of the Muslim brotherhood and of Islamic ideas leads to violence and the kind of trouble we have no heard about in the past 20 or so years. 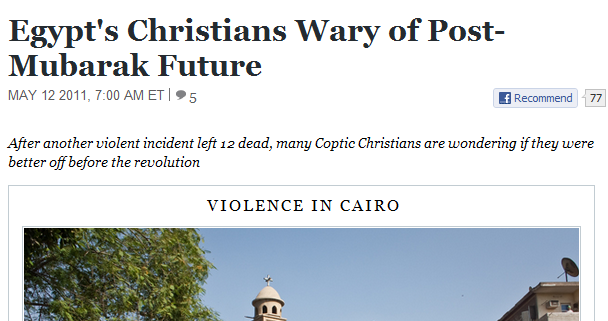 Egypt coptic church, and its members (who are Christian) are starting to feel the heat from the mobs in the streets, spreading old time blood libel stories about women held against their wishes because they converted to Islam and so on. It seems like there are a lot on Egypt’s streets today who will be happy to get into a bloody massacre of non Muslims and just get it over with, while the world is not really doing anything and the steady stream of people slowly starts to depart from this part of the world, heading into safer and more sane countries. Since the former president of the country was sent away it looks like the number of assaults and attacks on the Coptic church and its members is on the rise, and if the elections should bring the Muslim brothers into control things will not get any better. And why is this on this blog? simply to show how people act when religion is involved, how religion and its leaders can target anyone and move a large crowd of fanatic believers to do the most horrific and immoral things, just because it says so in a book.